The Atlas Deluxe pictured above is one of our favorite machines. We purchased it for the huge sum of $25 at a Kentucky thrift store. The pink is an unusual color for a sewing machine and is one of the few we have ever seen. The owner of one machine wanted $180. 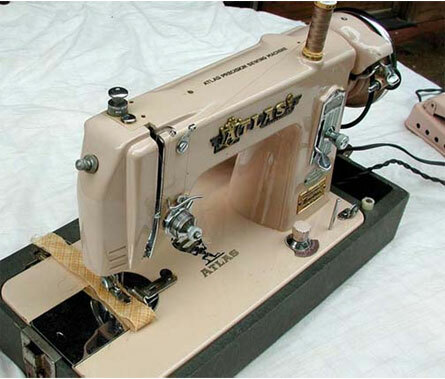 The Atlas was manufactured by the Brother Sewing Machine Company and is especially nice for old people with failing vision (Jim) to thread as it has a light immediately above the needle. The machine is a straight stitch machine sewing forward and reverse. It does not do zig-zag. Our Atlas came with a pink box of attachments and the all important instruction manual. (Sorry, we don't make copies for sale.) We have been able to provide answers to questions regarding its threading and operation to fellow owners of the pink machine. The Atlas is made of metal and is very heavy. Therefore it is almost vibrating free when in operation. If you are very dainty, you may need a helping hand hefting this iron out of the trunk of your Buick. Jim likes to use a patch like shown above to start sewing and lock the two threads together before actually inserting the fabric to be sewn; also the patch separates the feed dogs and pressure foot which prevents wear. Shown is an optional seam allowance guide as the pressure foot right side is narrower than 1/4 inch. We also have one of these machines that has a border around the base. A photo of that border is used in the banner a top of this page.